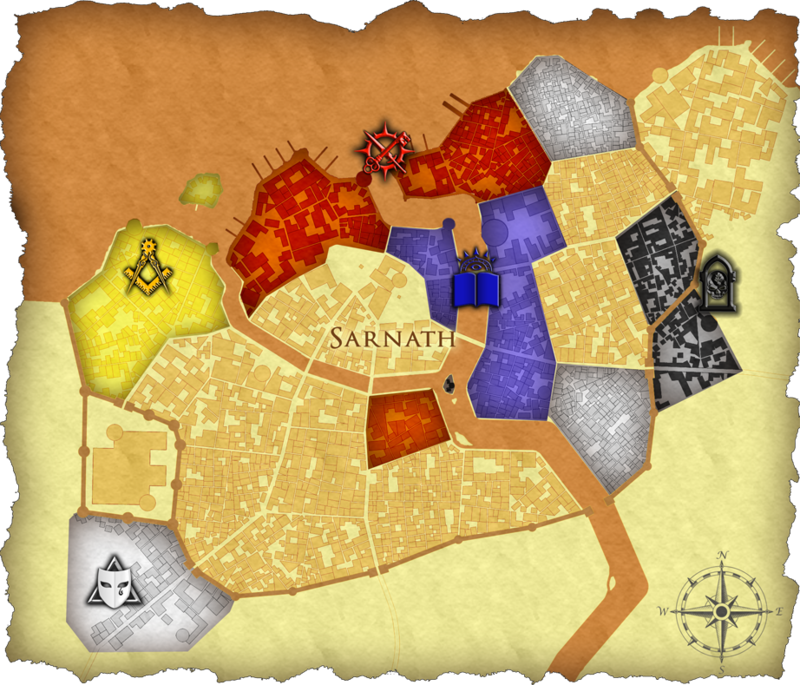 The last king of Sarnat departed more than a century ago and now a council of 7 men rules the shining city: one concilor from the noblesse whois the acting king, another councilor from the merchants league and five concilors from the major guilds of the city. explore the the fabulous city and the guilds with this maps! "The wonder of the world and the pride of all mankind was Sarnath the magnificent. Of polished desert-quarried marble were its walls, in height three hundred cubits and in breadth seventy-five, so that chariots might pass each other as men drove them along the top. For full five hundred stadia did they run, being open only on the side toward the lake where a green stone sea-wall kept back the waves that rose oddly once a year at the festival of the destroying of Ib. In Sarnath were fifty streets from the lake to the gates of the caravans, and fifty more intersecting them. With onyx were they paved, save those whereon the horses and camels and elephants trod, which were paved with granite. And the gates of Sarnath were as many as the landward ends of the streets, each of bronze, and flanked by the figures of lions and elephants carven from some stone no longer known among men. The houses of Sarnath were of glazed brick and chalcedony, each having its walled garden and crystal lakelet. With strange art were they builded, for no other city had houses like them; and travelers from Thraa and Ilarnek and Kadatheron marveled at the shining domes wherewith they were surmounted." quote from an anonymous historian.